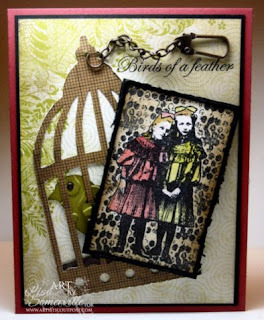 Don't you just love the new Tim Holtz Alterations line! I can't wait to order some of the new dies and embossing folders, my creative wheels are spinning! Have you ever wondered how someone's creative process works? For me, a lot of times I pick my images, then my pattern paper. This card was no exception. I started out by stamping the girls from the Birds of Feather plate from Artistic Outpost in Black Archival on Watercolor Paper, masked them with Eclipse Tape, then stamped the funky dots from the Generation Redux to cover the rest of my Watercolor paper. Afger removing the Eclipse Tape, I watercolored the images with Crushed Olive and Barn Red Distress Inks, adding Blush Marker for the face and hands. I used an Ink Blending Tool to add Soft Suede ink to the remaining uncolored areas. This panel was adhered to a Black Panel, where I used the Torn Frames Technique for the edges. Then I was in search for the perfect Pattern Paper! I'm a big fan of Basic Grey, and happend to find the perfect piece in the new Origins pad. I did use the Ink Blending Tool and Soft Suede ink to add some brown hues. I used another piece of the Origins paper to cut the Bird Cage, distressing the edges every so slightly. The Bird is also from the same die, I cut it from a piece of Kiwi Kiss and a piece of Chocolate Chip, then ran both the the Big Shot in using the Cheetah Prints Embossing Folder from Sizzix. I added highlights to the embossed areas with Soft Suede Ink, added a Mini Fastener as the eye, and popped the wing on a dimensional . The sentiment was stamped in Black Archival, and a Swivel Chain was added to the Bird Cage. The stamped colored panel is popped on dimensionals. Your card is awesome. Love all the details and elements that went into your creation. Just fabu! Super card...luv the little bird peekin' out from the side!